Modern Thoroughbreds trace their lineage to a stock of Arabian horses imported into England between the late 1600s and early 1700s. The English Thoroughbred was gradually introduced in other countries where it was bred for racing or used to improve local breeding stock. A son of the Darley Arabian, one of the three dominant foundation sires of modern Thoroughbred bloodstock, was imported to Virginia in 1730. The Darley Arabian’s son, Bulle Rock, along with roughly 180 Thoroughbreds introduced into the American colonies in the following decades, became the foundation of Thoroughbred breeding in the United States. 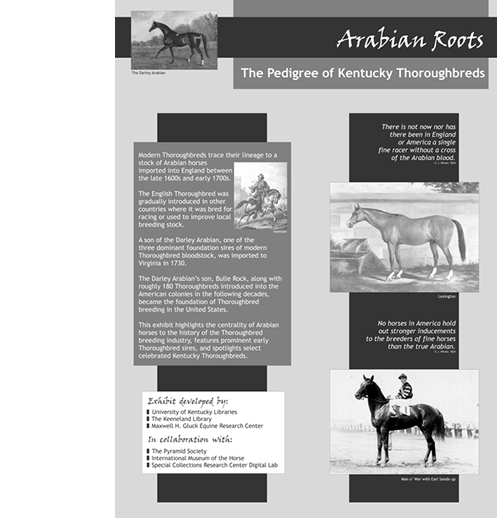 The image galleries below highlight the centrality of Arabian horses to the history of the Thoroughbred breeding industry, feature prominent early Thoroughbred sires, and spotlight select celebrated Kentucky Thoroughbreds. Click here to download a brochure about the image galleries.